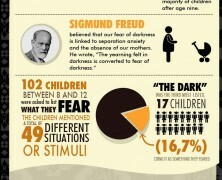 Home »Posts Tagged "Sigmund Freud"
Do you fear of the dark? Don’t be shy! Many adults do. According to Sigmund Freud dark-phobic symptoms find their roots in separation anxiety and mother’s absence. Peer experts postulate that there are genetic implications coming from our ancestry and the brutal era. Finally, how justifiable is for humans to turn spooky as the sun goes down?